Welcome to the first in our Docking Tips series. Our goal today is to show you a picture perfect docking, even in the wind and current. Boy! Wouldn’t it be great if it could always be this easy? You may be envious of the helmsman in our video selection but this could be you! Of course, this boat has many features that help make docking a snap. 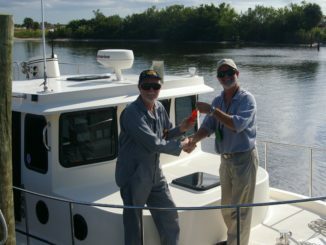 But the helmsman and mate have many years of boating experience. Practice does make perfect so let’s take a critical look at what we will see on this video. It is essential to understand where your wind and current are when anticipating close quarters maneuvering. The wind, though strong and gusty, will push this boat toward the dock. And the current is pushing on the bow so we call that docking into the current. Believe it or not, going against the tide/current usually offers better docking control than riding with the tide/current. When docking with the current you will feel as if you are going faster than you can safely manage. We first see this boat with intentions of docking on his port side against the floating dock. 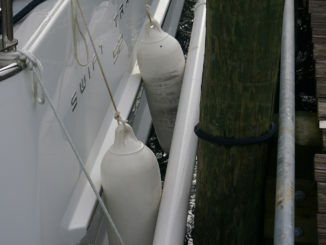 We notice fenders are deployed in preparation for protecting the hull against the dock. We also notice a large swim platform at the stern of the boat. The helmsman cannot see the swim platform so it’s good to really know your boat’s footprint- bow, stern, port and starboard. The mate has lines ready…before they are anywhere near the dock. Having lines ready on both sides is smart in case your slip assignment changes at the last moment. Thrusters are a wonderful option- bow, stern or both. 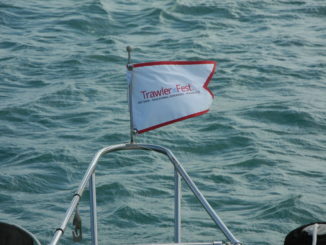 But even a thruster sometimes cannot fight a current or wind so it’s best not to rely on using a thruster to dock. Great tool to have but better to know how your boat will maneuver in all situations. Most importantly, good boaters know how their boats maneuvers in close quarters. And great boaters know how to work together with a team effort. Communication with everyone, from the helmsman and crew to the marina staff or other boaters on the dock. And if you want to be the best at anything then you must practice. 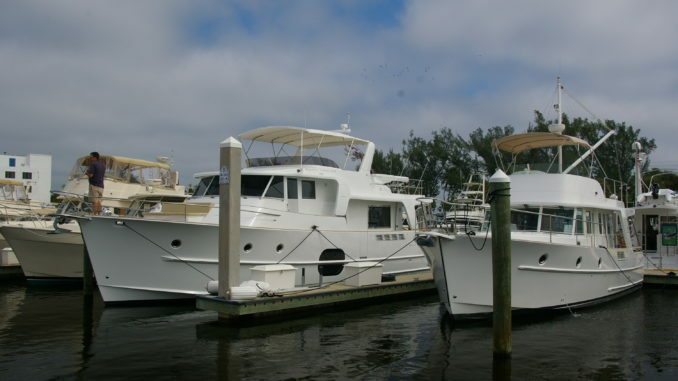 This video shows boaters who have many years of docking under their keel. I’ll bet they have a few close calls to share when describing their first boating memories. If you can’t wait to learn it all then click here to order your very own Docking DVD, part of a training video series from Captain Chris.